Designed for portable applications, the WA series load banks are weatherproof construction, designed for harsh and tough environments for testing and commissioning of generators. Featuring rugged stainless steel immersion proof and vibration proof resistors, integrated switchgear with individual load circuit breakers. Controls are electronic touch type, models available with locally fitted controllers or remote data capture type. WA Series portable load banks incorporate 5kW increments for testing small to large generating sets. Typical applications include generator manufacturing, workshop type servicing and on-site commissioning. 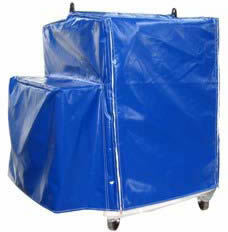 The units are portable or mobile, and are suitable for trailer mounting. Coupling with the RM series reactive modules, the load banks extend to provide power factor loading. WA series load banks are completely weatherproof to IP55 (NEMA 4X), vertically fan cooled and incorporate SEPHCO SDL stainless steel immersion proof and vibration proof resistors. Safety protection includes the SEPHCO Triple Interlock load protection system, which safeguards against fan failure, air flow restriction, high temperature and fan reversal. WA series load banks incorporate touch type LCD display control panels, locally fitted or remote data capture type. Featuring fan start-up, kilowatt selection to 5 kW resolution, fan alarm LED, fan cool-down LED and emergency stop. 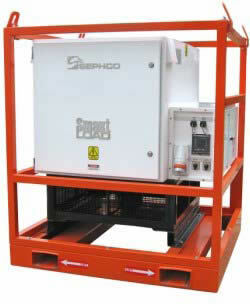 Additional features of Sephco load banks include circuit breaker protection for each load group and full accessibility to switchgear components and resistors. WA series load banks are supplied with full control facility, locally fitted or remote data capture type. Units are fitted as standard with external power sockets and fan reversal switch. Options include, digital display power meters, trailers, cable reels, PowerLock connectors and load bank protection cages. The MC12PMB control panel is standard on all WA…..MC portable type load banks. The control panel features a touch type keypad and LED load display, with simple operation of the load bank start up, kilowatt selection and load bank status. The unit automatically configures the load steps in the load bank to provide instant kilowatt response as selected by the Up/Down keys. Other features include load bank “system check” which prevents loading in the event of fan cooling failure, fan reversal or high temperature. Automatic fan cool-down period is applied when the fan stop or load dump is activated. The LC12DAL controller is a portable processor capable of controlling one or more resistive or reactive load banks from a distance of up to 100m. Operating features include a four-line displaywith simple step-by-step instructional prompts, display of load values such as kW, kVa, V, Hz, PF, Amps and load time. Choice of operation includes manual and automatic load routines. The automatic loading feature has loading routines with time duration and pause override function. Changes to a load routine such as load size and time, is possible at any time during a load test from the pause function key. The controller automatically tunes and corrects the load bank in the event of voltage or resistance fluctuation. The controller also ensures that the load bank is fully protected against over voltage or frequency, preventing the test to proceed. All functions are fully displayed, including warning messages, such as voltage exceeded, frequency incorrectly set, emergency stop, load aborted and cooling failure. The LC12DAL construction is made of solid aluminium extrusion with die cast corners, weatherproofed and sealed to IP55. The handle can be rotated and locked in any position to suit the user. Connections includes a 6 pin input connector, standard USB port for connection to a PC or Laptop, to obtain additional on-line graphics of actual load tests. Additional features of the controller includes adjustment of all the operational settings namely operating voltage, frequency, power factor, data capture printing intervals. Test routines are held in memory for repeated use.Data captured includes all electrical values, such as phase voltage, line to line voltage, phase currents, line currents, frequency, kW selected, kW achieved, kVa, power factor and elapse time. Safety features include load bank “System Diagnostics” to ensure that voltage and the operating current do not exceed the load bank’s designed rating. The LC12DAL controller is also available in a panel mounted version for test cell operations. WA Series portable load banks are available in two control styles – “Local- Manual Control” or “Data Capture Remote”. Both styles are available with add-on control options and accessories. Auxiliary Power 3 phase inlet socket and reverse pin appliance plug fitted for external power, for fan and control operation. Includes Genset/Aux selector switch. Protects load bank from generator power failure during testing. 100 Metre Data Cable extension reel with Mill.Spec. plugs to suit remote data capture controlled WA….LCD series load banks. Red, White, Blue and Green connector sets mounted and fitted to the load bank. Weatherproof Digital Power Display meter. For digital display of operating Volts, Amps, KW and Frequency. A convenient way to connect power cables to the load bank. Weatherproof to IP67, available in 400Amp and 600Amp capacities, Red, White, Blue & Green. Bevel Gear hand rewind type, available in three and four segments. Reels suitable for flexible cables up to 240mm². 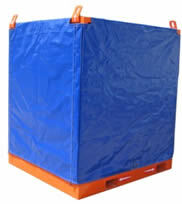 Suitable for Trailer mounted load banks. Cable supplied is extra. Load Bank Transport Protection Cage & Skid Transport protection cages are fully galvanised cage housings to transport and protect the load bank from physical damage during transportation. Cages are fitted with lifting eyes and forklift pockets. Model PCLB2V: To suit load bank model WA2V200…..
Model PCLB4V: To suit load bank model WA4V400…..
Model PCLB6V: To suit load bank model WA6V600…..
Model PCLB12V: To suit load bank model WA12V1200…..
Model PCLB18V: To suit load bank model WA18V1800…..
Model PCLB24V: To suit load bank model WA24V2400…..
Vinyl covers with Valcro sides & tie-downs for Mobile Load Banks and Load Protection Cages. Part No. VC2V: To suit load bank model WA2V200…. Part No. VC4V: To suit load bank model WA4V400…..
Part No.VC6V: To suit load bank model WA6V600…..
Part No.VC12V: To suit load bank model WA12V1200…..
Part No.VC18V: To suit load bank model WA18V1800…..
Part No.VC24V: To suit load bank model WA24V2400…..
For Permanent Installation To Periodically Test & Exercise Stand-By Generators & UPS Systems. Weatherproof Construction, Complete With Controls. This entry was posted in WA TYPE. Bookmark the permalink. The fields below are optional, in order to help us serve you better and expeditiously, may we ask you to give us as much information as possible, Thank you. You can click here to go to the previous page or browse our website for the information you require, then click. "Back to Inquiry Form"to return the Inquiry Form or click the "Contact" link top right.